The Tesla Model 3 is Elon Musk’s affordable electric car for the masses. At present, only a rear-wheel drive variant exists, though all-wheel drive models will arrive in good time. Two battery options exist – a 220-mile range base model that’ll do 0-60mph in 6.5 seconds, and a 310-miler that’s quicker to 60 by 0.4 seconds. Supercharging is available. A Premium upgrade package adds 12-way power adjustable heated leather seats to the cabin, open pore wood dash inlays, and a tinted glass roof. Safety features include autonomous emergency braking and collision avoidance, and Tesla’s Autopilot is available. 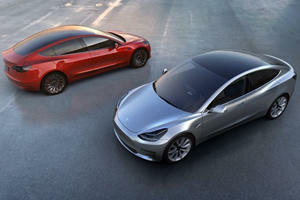 The Tesla Model S made Elon Musk’s company a household name for its ludicrous performance and big electric range, while the Model X extended the appeal to families looking for a green crossover. 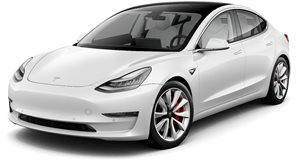 Originally touted as the Model E in Musk’s S-E-X-Y model line-up, the Model 3 is the Tesla for the masses, the model to take Tesla mainstream and secure it in motoring history as the true pioneer of the battery electric vehicle – the future of mobility. Kicking off in rear-drive guise, all-wheel drive will join with a range of battery options to extend the range further. The Tesla 3 is an unorthodox car with the most unorthodox of interiors for a 5 seater passenger sedan. To start with, there is but one instrument in the entire cabin – a monstrosity of a 15-inch landscape orientated touch screen. It displays any and all functions in the Model 3, with the speedometer readout displayed in the upper left hand corner. The rest of the dash is barren, a horizontal slab of simplicity. The Model 3 seats 5 on standard cloth upholstery, and while Tesla makes bold claims about spaciousness, the floor-mounted battery packs mean rear passengers sit with high knees jammed against the thick front seats. Head room is more than sufficient though, and the dual panoramic windscreens, front and rear, create the impression of an abundance of head room. Like the Model S, the 3 features a front and rear trunk, together boasting 15 cubic feet worth of cargo capacity. Riding on 19-inch alloy wheels and low profile 235/40 tires, there’s an edginess to the ride quality of the Model 3. The suspension is firm – comparable to that of a Alfa Romeo Giulia – and the quick ratio steering helps the comparison along further. Body-roll is near on non-existent, the low-mounted battery pack no doubt helps, but the suspension tuning is on point in terms of body control and handling. Changes of direction are dealt with sharply, though the steering is a little light – however feedback is decent, but not sporting. However there seems to be little trade-off in comfort. Despite the firm ride, the suspension is supple enough to soak up most broken surfaces. Anyone expecting Model S levels of comfortable cruising will be disappointed, but those hoping for something vaguely sporting will be more than thoroughly impressed with the Model 3’s handling dynamics. Tesla remains coy on what size the battery packs are, referring to their size by their range rather than kWh capacity. They cite two available batteries, a 220-mile as standard with a 310-miler available as a long range option. They’re also coy on power figures from the electric motor, but the 220-mile variant will still crack 0-60mph in 5.6 seconds whilst the larger battery enables a 5.1 second sprint. Rear drive is only available for now, but Tesla says twin-motor all-wheel drive models, and bigger batteries with more performance will be available soon too. As with other Tesla models, supercharging is available – for a fee. Standard equipment includes cloth upholstery, Wi-Fi and LTE connectivity, keyless entry, and dual-zone climate control. A $5,000 Premium package adds heated leather seats, 12-way power adjustable front seats, open-pore wood inlays on the dash, the tinted glass roof, and a premium audio system. Another $5,000 nets you Enhanced Autopilot, and a future full self-driving mode will also be available. Tesla claims the Model 3 will score 5/5 stars in crash testing, as it features eight airbags, electronic stability control, and auto emergency braking and collision avoidance as standard. At present the 3 hasn’t been crash tested. 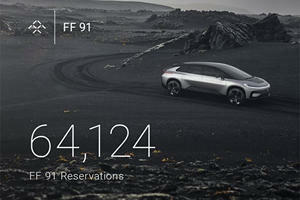 The number of people that have reserved the Faraday FF 91 probably won't be much concern to Tesla.